Unfortunately, Dominick Cruz’s injury woes that have plagued his illustrious career have not ceased, as it was reported by MMA Brasil Tuesday that his scheduled bout with John Lineker at UFC 233 is now off due to Cruz being forced to pull out of the fight. There is no word yet on the specifics of the injuries sustained by Dominick Cruz. The report also states that Cody Garbrandt is being considered as a possible replacement for the bout, but sources close to MMA News confirmed that Garbrandt is still recovering from a hand injury and will not be able to step in as a replacement. Still considered by many to be the greatest bantamweight of all time, the last time we saw Dominick Cruz compete was at UFC 207 where he dropped the bantamweight championship to Cody Garbrandt back at the end of 2016. Before dropping the title, Cruz was undefeated in the UFC and was enjoying a 13-fight winning streak. With an already remarkable record of 22-2, we can only speculate on what Cruz’s record would look like if not for the nagging injuries that have continued to halt the future Hall of Famer’s tracks. 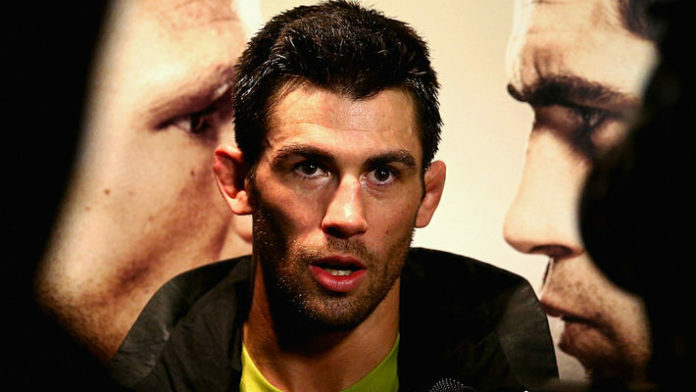 Do you believe we will ever see Dominick Cruz back in the Octagon at top form ever again?